Generally speaking you have 2 lungs. The right has 3 lobes and the left has 2 lobes so the left lung can make room for your heart on the left side of your chest. If you look at the image you can use your imagination to divide the lungs on either side into an upper dome, a middle section and a lower section. This is important, as you can isolate each section to activate different components to your breath. As always, if in doubt check with your health care provider before attempting any exercises described. This breath is most commonly seen in late pregnancy when the baby or babies occupy the space in the abdomen. The abdominal and lower costal breaths are much more limited so the upper chest moves up and down more visibly opening the airways at the peak of both lungs. We also see it in patients with limited lung capacity. For example if someone suffers from chronic obstructive airways disease, often during an exacerbation of their symptoms (during a chest infection), they will use their upper costal muscles by holding on to a steady object to help pivot their collar bones and shoulder blades to raise the chest up and maximise air entry. Place your hands just under the collar bones on either side of your upper chest. Watch what happens when you breathe in and out. As you breathe in your chest moves up and as you breathe out your chest moves down. Repeat this several times to experience the movement without interfering. Now breathe deeper into this area of the lungs by actively raising the chest further as you breathe in & relax as you breathe out. Repeat this 3 times. You will be surprised by how big a breath you can get into this upper lung area. 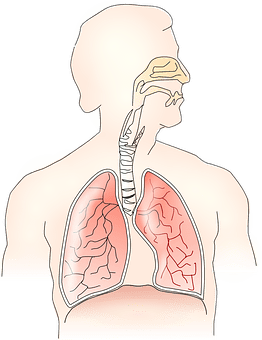 We are not normally conscious of using this part of the breath day to day but in my next blog when we put all 3 parts of the yogic breath together you will appreciate the piece that each area of the lung contributes to this special breathing technique. Enjoy getting to know your body and the work it does for you unconsciously every day.